I flew in to SFO this past Sunday and made my way via mass transit to the airbnb room I had rented in Cole Valley. Before I could even set my bag down in the room, my friend Jonathon (the airpair founder TXTed me inviting me to lunch with a group of friends. A few minutes later a mini cooper zipped down the block, pulled and aggressive U-turn, and out popped Jonathon from the passenger seat. He was just finishing zipping his pants and buckling his belt, which he explained was due to coming straight from a 2-hour Bikram yoga class. 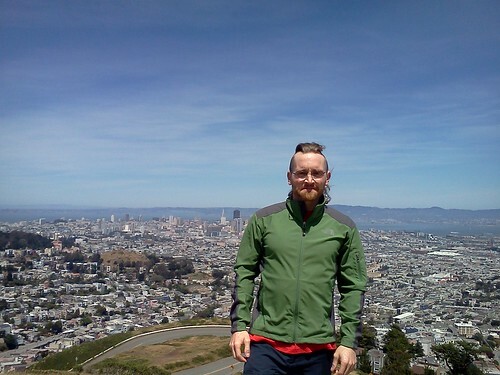 I hopped in the back and Saharose, Jonathon's friend, whizzed us up to Twin Peaks with the sun roof open on a lovely sunny day. We stopped only for a minute to enjoy the view from Twin Peaks and then raced over to Regalito to join a large group of 9 friends for a delicious gourmet Mexican feast. We ordered family style and feasted on molé, beans, guacamole, and all sorts of delights. There was lots of startup/tech banter and the group was in very high spirits as well as a pretty good range of ages and backgrounds. 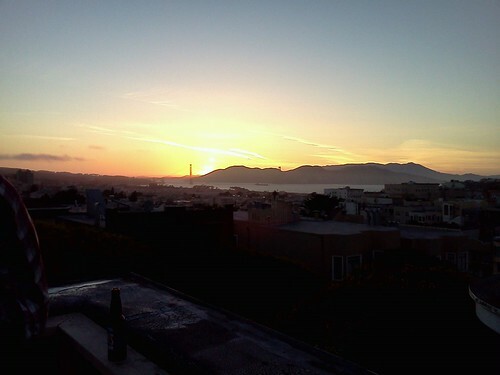 Afterward we headed back to Jonathon's apartment in Pacific Heights and enjoyed some tea and sunshine up on his roof. We got around to coding together a bit as well, but before long it was back into social mode as folks started arriving for a BBQ on the roof. Jonathon cooked up a bunch of delicious food and we hung out, played some corn hole, and watched the sun set behind a great view of the city. I had no plans in particular for Sunday other than some pair programming, and it ended up being a truly epic day of delights! Monday I worked in the morning from Bacon Bacon. I learned that this bacon specialty business has a restaurant as well as a food truck, but the restaurant came out on the losing end of a zoning/complaint issue and will have to close up as of Friday. So I got a chance to eat there during their last week of operation. After a few hours coding there, I went back to my room and worked from there. I enjoyed a good Thai lunch later around the corner. Monday after work I took the J Muni to lower haight to visit Rebekah Howard and geek about about frugality a bit. She gave me a tour of her place and we chatted for a while and had a nice visit. She's one of 2 people that I interact with a lot on twitter and almost never in person. I decided to walk back and explored around a bit. I ended up at Crepes on Cole for a late dinner and bumped into a former coworker of mine from my brief job at Sococo. I had a truly delicious crepe with ham, swiss, and avocado, and they were playing a bunch of jazz alto saxophone records in a row, so I sat and enjoyed for a while. However, I wanted to get to The Ice Cream Bar before it closed, so I headed over just after 9:30 and had some yummy ice cream. Tuesday morning I worked from my airbnb room since the owners were out and then headed into the haight to work a bit from Coffee to the People before taking muni to The Great American Music Hall to sound check for the Legitimate Front gig. Tuesday afternoon I headed to the Great American Music Hall for our sound check. We milled around a bit and I coded from the green room, which featured better wifi than my hotel. We did a long and thorough sound check, and then I headed to the nearby Hotel Carleton to check in. This marks the first occasion in my music career to date where a gig has provided airfare and hotel (!). Tuesday's concert was the National Venture Capital Association's big shindig during their conference and was billed as a sort of "Battle of the Bands" featuring bands whose members come from the venture capital/tech/startup world. There were 3 or 4 VC bands plus Pat Monahan from Train headlining. All the bands were good. Notable was the singer from Silicon Valley Bank. We played a short set just before Pat, and got a lot of positive feedback. The catering was also good with some pork sliders and a huge chocolate station doling out chocolate truffles on a stick. Wednesday I worked from a coffee shop near the hotel in the morning, then an Internet cafe with an annoying time-limited wifi setup, and then back at the hotel with crappy wifi. 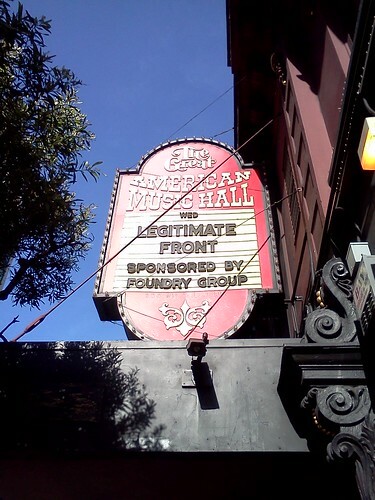 Wednesday's event, also at the Great American Music Hall, was a private party thrown by Foundry Group. Legitimate Front was playing the whole night and we got an even more thorough sound check this time. My friend Pat and my cousin Ed came and we chatted a bit during the songs without horns. Afterward Pat and I got some food at nearby Mel's diner and caught up a bit. The waitress was taken aback when I ordered an English muffin, toasted with butter and cinnamon. "We don't have cinnamon", she said. Yes, you do, I replied confidently. She looked at me strangley. "It's like the #4 spice in the world. You have it", I insisted, and she relented and later served me my muffin with a little metal ketchup bowl containing about 1/4 jar of cinnamon. As we left, one of Jonathon's flatmate's, Steve, came upon us as he was walking by and said hello. The three of us chatted and walked a bit and ended up at the Edinborough Castle bar where Pat and I mostly nodded politely while Steve went into inebriated "Bro" mode and discussed every woman he could see in the bar. Thursday I took BART to my next airbnb place to drop off my luggage in the morning before heading out to work. 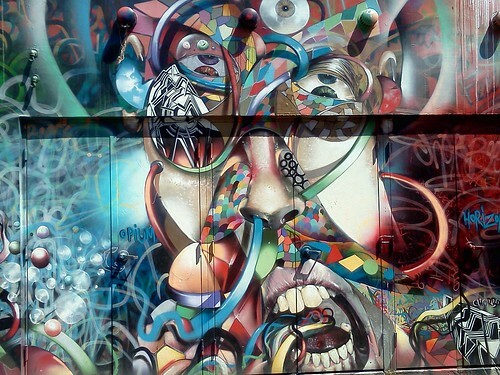 I was fed up with suboptimal coffee shop working conditions and decided to walk to the Parisoma coworking space in SOMA. I worked there in the morning, pulling a "catch me if you can" since no one seemed to be on reception duty, so I just set up shop and got to it. It was fairly quite in the morning but by 11am or so it was packed. In the afternoon I went back to Jonathon's where my former coworker from Dojo4, Alyssa, was (she's recently become Jonathon's flatmate as well). I ate some leftovers from the Chinese food they had, brought some donuts for the group, and set to working. There were about 6 folks there coworking as I guess they do regularly. I worked late and then walked from there to Embarcadero to meet up with a big group of Pizzis for dinner at The Slanted Door. It was a family-style situation and we ended up with more food than we could eat, primarily because the entrees were brought out slowly and steadily over the course of 90 minutes or so. When the last 2 chicken dishes were brought out around 9:30 everyone groaned. Dessert was a lychee cotton candy, which I think is probably the most ridiculous thing I have ever been served in a restaurant. Friday I worked at NextSpace coworking near the Montgomery BART station and did my usual Friday bug blitz and mad dash to whip the software into shape so I can record a demo screencast. I had some sushi for light lunch. When everything was buttoned up I took BART to Civic Center and then planned to take the Muni bus north on Van Ness, but I got sick of waiting for it and just decided to walk & jog the rest of the way to Jonathon's house. We grabbed some large New Castles from the bodega directly below his apartment and spent about 2 hours pair programming on the airpair.com code base. After that I rendezvoused with Pat who drove us out to East Bay for our friend Quetzal's celebration of getting citizenship. My old friend Marcia was there along with a bunch of their SF friends I have come to know over the years. Realizing I hadn't eaten since lunch and had a couple large beers, I was delighted when we decided to make a food run to a nearby taco truck. It was yummy but quite slow. Today (Saturday) I am mostly taking it easy and strolling around the mission. I had some chai while blogging waiting for Limon to open up at noon so I could get some delicious rotisserie chicken and yuca fries. This airbnb place I think will have to go down as my first mistake as a guest. It's a terrible Target futon instead of a bed and there is absolutely no cushioning or support to conceal the support beams you are sleeping on, so it's sort of like laying a ladder on the ground, throwing a blanket over it, and calling that your bed. Saturday afternoon I took a much-needed nap and then walked around the mission quite a bit enjoying the nice weather and interesting murals. I hemmed and hawed a bit before deciding to get some Indian street food for dinner followed by Xanath ice cream for dessert. I watched most of Skyfall via vdio before dozing off. Sunday morning just enough time for a quick breakfast sandwich then BART back to SFO to head home.